I recently read an interesting point of view, ‘5 Reasons Not To Use Google Analytics’, where Andrew Edwards outlines why not to use the most popular free measurement tool. His remarks range from the level of service you can expect from a free solution to the data security and what happens to all the data they record on your behalf – after all, nothing is really free. But I feel there is something crucial missing from the list, one fundamental reason to stay clear of Google Analytics is not listed in the 5, there needs to be a 6th point at the very least. Given that 28% of all internet time is now from smartphones, the list needs to include “mobile”. In fact mobile would be my number 2 reason not to use Google Analytics, right after “you care about data security”. So my addition to this point of view would be “Don’t use Google Analytics if mobile matters to you”. Mobile web, apps and marketing campaigns feature in every successful company’s plans and strategies today. Even Google has a “mobile-first” strategy, where everything is developed for mobile ahead of desktop computers, but despite being heavily focused on Android phones their analytics solution is fundamentally designed for desktop deployment. This can be proven quickly and easily by performing a simple side by side comparison of Google Analytics with Bango Analytics – on one of your web pages just add a Bango Analytics tag alongside your existing Google Analytics tag. This will clearly show the serious shortcomings of depending on Google Analytics for mobile. 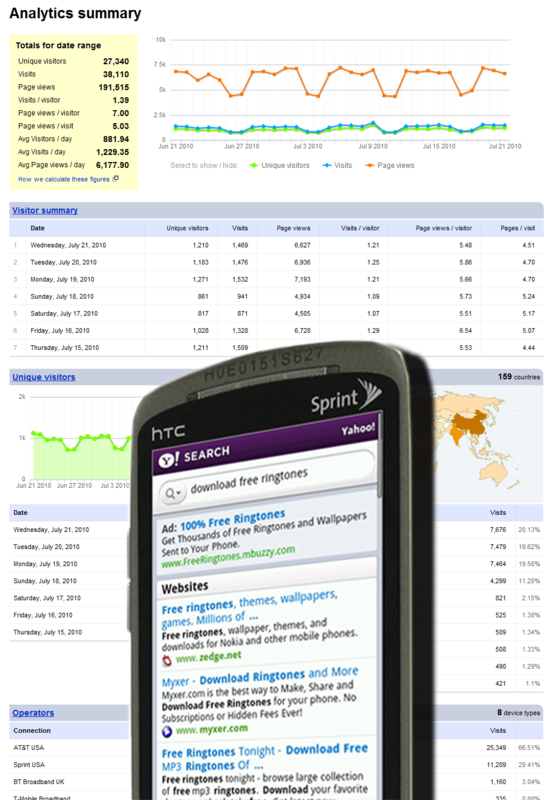 Like most of the older analytics companies, such as Adobe/Omniture, WebTrends or IBM/Coremetrics, Google claims their analytics product works with mobile, but there is a significant difference between simply reporting that the device is a Samsung Galaxy S running Android 2.3, and reporting that the consumer is a Virgin Mobile USA subscriber currently connected over Wifi in the UK and that you have seen them 14 times, the first as a result of your Yahoo! mobile campaign. Companies that depend on Google Analytics are typically unaware that they are not receiving accurate results for mobile visitors and make erroneous assumptions about their mobile traffic, thinking that there are far more Android or iPhone visitors than they may be getting. Or wondering why they are seeing a small number of hugely active BlackBerry users in Canada, because their current measurement solution cannot separate individual BlackBerry devices connecting through RIM Gateway Servers or identify their true carrier and connection. As a result they miss a large percentage of mobile visitors and fail to receive important facts about devices, carriers, virtual networks and connections (carrier versus Wifi). This does however open up a significant competitive advantage to those wise enough to select a solution designed specifically for today’s mobile infrastructure, such as Bango Analytics. 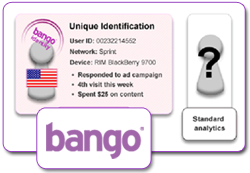 Bango Analytics achieves this significant differentiation through advanced server-based measurement and identification technology, combined with unique relationships with carriers, device manufacturers and browser developers. The data Bango receives delivers much higher accuracy than legacy PC analytics along with a more valuable range of data to help you optimize your mobile strategy. Take the Bango Analytics challenge and see why a growing number of major brands and agencies now depend on Bango Analytics. This entry was posted in mobile analytics, mobile web. Bookmark the permalink.